With the U.S. no longer is part of the Paris climate accords, Indianapolis Mayor Joe Hogsett believes it is time for cities to take the matter of reducing carbon emissions into their own hands. At the state’s second annual Climate Leadership Summit, Hogsett announced this week that the city is committed to achieve carbon neutrality by 2050 — keeping Indianapolis in line with the Paris agreement that President Donald Trump withdrew from earlier this year. “The climate is changing,” Hogsett said at the summit, “its consequences, very real. With this commitment, Indy joins the ranks of many other cities around the country and world — including Seattle, New York, Minneapolis, London, Berlin and Sydney — who are working to reduce or eliminate their carbon footprint. That footprint is a measure of how day-to-day activities that produce greenhouse gases — such as burning fossil fuels for electricity, heat and transportation — affect the environment and climate. 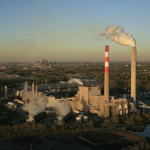 Indianapolis Power & Light announced plans Friday to convert an aging, coal-fired power plant on Harding Street to natural gas by 2016. 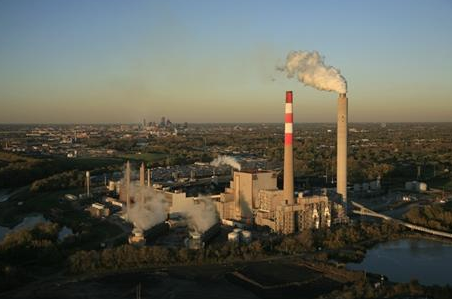 The subsequent reduction in emissions of CO2 for Indianapolis will be evaluated via several independent methods through the Indianapolis Flux Project. Harding Street Power Plant in Indianapolis, IN. “French investment and industrial holding company Bollore Group will invest $35 million in creating its “Blue Indy” program in Indianapolis to promote electric cars and advanced batteries. Vincent Bollore, founder of the company, said in a telephone interview that the program will start within eight months and that it will use 500 Bluecars and 1,000 charging stations, according to Automotive News. “Members” of Blue Indy will be able to swipe at one of 25 initial stations in the city and “borrow” a car to get to different destinations, WTHR reported. Indianapolis is looking to have 125 electric cars in its fleet by this year’s end, with students, businesses and downtown residents being the service’s biggest users. UNIVERSITY PARK, Pa. — If a community wanted to cut its greenhouse gas emissions and decided to take steps to do it, how would it know if the steps it was taking worked? A team of researchers from Penn State’s College of Earth and Mineral Sciences and several other universities has been testing a method for doing that, by capturing readings of greenhouse gases in an urban atmosphere. Known as INFLUX, The Indianapolis Flux Experiment uses a combination of measurements taken on towers and readings from aircraft to find out how much carbon dioxide and methane is being emitted from the city. “It is an independent way to quantify emissions levels and later validate changes and reductions. We hope to demonstrate this and learn what is required to make this work,” said Ken Davis, professor of meteorology at Penn State and a lead researcher on the project. The results are expected to provide data that could be used to establish standards for measuring greenhouse gas emissions. The project will document the accuracy of the method, and establish open data records that will allow for independent verification of the findings. The Penn State team’s part of the project includes deploying and operating the sensors that are distributed across the metropolitan region on 12 communications towers and are designed to measure the greenhouse gases carbon dioxide and methane. The towers also host measurements of carbon monoxide and other tracers of industrial activity to help identify the sources of the greenhouse gases. That data is being coupled with measurements taken during 40 flights over the area and with information about buildings and their estimated individual energy usage. Davis said the expression “the atmosphere can’t lie” is true in cases like this where the atmosphere records the earth’s emissions. The tower-based sensors offer an independent way to measure changes in emissions, including whether reductions are taking place. Davis explained that this method is really quite simple: As air flows across the city, emissions accumulate in the atmosphere. By measuring this accumulation and quantifying the wind speed and atmospheric mixing, the researchers can infer the emission rates. “It’s like putting a bag over the city and watching the greenhouse gases accumulate in it. In this case, the ‘bag’ (the atmosphere) is very leaky, since the air flows through and across the city,” he said. That “leakiness” doesn’t prevent the measurements from being taken and interpreted, but the atmospheric conditions must be carefully documented for the emissions estimates to be accurate. The advantage of the method is that any and all emissions end up being detected in the atmosphere. Davis noted that using atmospheric data to measure emissions is not the only way to obtain readings. Using the atmospheric sensors complements the inventory method by capturing continuous, total emissions data from a chosen location rather than getting a snapshot in time for many different types of emissions (such as home heating, industry and transportation), then piecing this data together across time and space, as must be done for an inventory estimate. In addition to managing the tower-based measurement collections, the Penn State team is running three numerical tools —the Weather Research and Forecast model, the Lagrangian Particle Dispersion Model and a Bayesian matrix inversion — to infer the rate and location of greenhouse gas emissions. “We incorporate building-by-building estimates of greenhouse gas emissions, biogenic fluxes and flow into the area from storms and neighboring cities,” said Davis, who is also an associate in the college’s Earth and Environmental Systems Institute. Started in fall 2010, the project receives funding from the National Institutes of Standards and Technology and is likely to be extended for an additional three years. The team includes researchers from Purdue University, Arizona State University, University of Colorado, the National Oceanic and Atmospheric Administration and EarthNetworks Inc., a Germantown, Md.-based company. At Penn State, research associates Bernd Haupt, Thomas Lauvaux, Natasha Miles and Scott Richardson are part of the INFLUX team, as well as graduate students Laura McGowan and Daniel Sarmiento. A new student, Kai Wu, will join the team this fall. The above picture is a snapshot of the city of Indianapolis, as seen through its greenhouse gas emissions. All those glowing green patches of land – those are individual residences contributing to the city’s carbon footprint thanks to home heating, lighting and appliances. The tall red towers illustrate the emissions coming from commercial properties and industry. And those squat red bars cutting through the city – those are cars traveling Indianapolis’ beltway at rush hour, emitting carbon dioxide as they go. The software corrals publicly available data wholly unrelated to climate change. That includes property tax filings that reveal the size and age of buildings, how they’re used and what fuel heats them, DMV records on auto maintenance and inspections, and Metropolitan Planning Organization traffic count estimates. “None of that data has been collected technically for any environmental reason,” Gurney says. And this is one of the strengths of Hestia. The United States and other nations have objected to international climate treaties that don’t include rigorous verification of emissions levels and reduction efforts. We can’t solve the problem, the argument goes, until we can accurately measure the scope of it and what governments say they’re doing to address it. INDIANAPOLIS – June 10, 2013 – Mayor Greg Ballard, Bolloré Group, and leaders from Indianapolis’ largest employers, universities, hospitality destinations and civic organizations today announced that Indianapolis has been selected as the site of the largest electric car share program in the United States. Bolloré Group plans to invest approximately $35 million to launch an all-electric car share program in the city next year. The system will feature 500 electric vehicles and 1,200 charging stations at 200 car-share locations. The move marks the first time Bolloré will replicate the success of its Paris car share program outside of France. The yet-to-be-named Indianapolis car share program is modeled after Bolloré’s popular Autolib’ service in Paris which features over 1,700 electric vehicles, 4,200 charging stations, and 37,000 members. As in Paris, the Indianapolis service is aimed at providing new mobility options to the public. It will also allow Indianapolis to become one of the most “electrified” cities in the US with a dense network of charging stations available to private EV owners. HOW IT WORKS: The program is based around short one-way rentals, unlike some other US models which require the user to return to the vehicle where they rented it. Users pay a membership fee (daily, monthly, or annually) and receive an RFID card. When they wish to rent a vehicle they reserve a car on-line or at a dedicated car share kiosk, they unlock the car charger with their card, and then swipe the card on the windshield, which unlocks the car and allows them to drive off. The in-car GPS allows the user to reserve a parking spot with a charging station near their destination. Once they arrive, plug-in the vehicle and the transaction is complete. The user can then reserve another vehicle for their next trip, as needed. The rates for the Indianapolis service have not yet been established, but in Paris, membership costs $16 per month and a 20-minute trip costs about $4.50. Business/Governmental Car-Share: The car share program will be available to individual members and government/corporate users. The City of Indianapolis and many other governmental and business organizations are looking into corporate memberships in order to reduce the size of their vehicle fleet. Bolloré will begin hiring local management and marketing teams in the next few months. The service is aimed to be a public service and Bollore will work closely with the city in the planning phase and continue discussions with key transportation, neighborhood, business and tourism groups to identify car share locations and other service aspects. The city will assist Bolloré to identify the car share locations, reserve on-street parking where necessary, and enforce reserved parking restrictions with its partners at Park Indy. The company expects to launch the car share service next spring. Plans are being made for a tracer release experiment, led by Thomas Watson (BNL). 1. Quantify the absolute fluxes from individual point sources. 2. Quantify the accuracy and precision of the atmospheric inversion system designed for INFLUX. An intensive drive-around campaign led by Purdue University occurred in June 2013.